It’s here. Well, it’s almost here. Unless you’re in one of those places where it is actually here, in which case you can disregard that second sentence. What am I talking about? I don’t know. 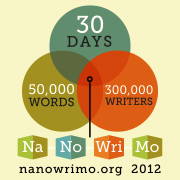 NaNoWriMo, of course! As the hours tick down to minutes, I’m still not entirely sure what I’m going to write. Part of me really wants to work on the last third of The Spoil of Zanuth-Karun, which is all plotted out and simply needs some time and attention. I think NaNo could give me that extra boost of discipline to really get it finished. But the rest of me wants to throw all prudence to the wind and work on my new project, which is, of course, more in the spirit of things. I’m not staying up past midnight tonight, so I’ll have to think about it tomorrow. Writing all day for work hasn’t dimmed my enthusiasm quite yet – it’s actually been going very well and I’ve started to get the hang of some things – so maybe I’ll be able to sneak in a bit of fiction during my lunch break. I hope the hurricane hasn’t been too disruptive for you all, and that everyone is safe and sound and recovering as quickly as possible. If you’re without power but you’re reading this, thanks for using some of your precious battery life on me. Grab a flashlight, a pen, and some paper and get writing. If you’re not without power, you have absolutely no excuse not to participate. Sign up and join the fun. I dare you. Fitting it in where you can is a great strategy. I think it’s less intimidating than sitting down and trying to force 1667 words all at once. I hope lots of your students take up the challenge! Good luck!